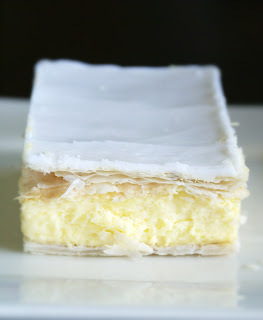 I don't really know how this picture of a Vanilla Slice ended up here. I was writing about vanilla and then I got to thinking about vanilla lipsmackers (you remember them right?) and then I was all like, "how scrumptious and delightful is Vanilla Slice?" Weird! But don't go worrying about that because I have discovered something very interesting about vanilla - the scent, not so much the slice. Dr Oz says the scent of vanilla has been proven to cut down on your cravings for sweet things such as chocolate or vanilla slice. Apparently using vanilla creates a calming sensation in the body. Vanilla fills your senses so you no longer have the desire to fill those senses with food. You can use vanilla to reduce stress, depression and anxiety too and let’s face it stress is a pretty big contributor to wolfing down half a block of chocolate so maybe there is something in this. I tried it and I don’t know. I can’t report that I gave into any food cravings while the vanilla scent wafted through the house but can I say I felt immediately relaxed? Not really. Although I was watching a fairly juicy episode of the Walking Dead; perhaps that counteracted vanilla’s calming properties? Vanilla is a deliciously lovely scent and if there is even a small chance that its inclusion in my life will have me forgetting about vanilla slice (or chocolate) then I think I should go with it….